Snowboarding Whistler is a 104 page long graphic novel about a group of Australians who leave behind their sunny surf spots to spend a winter season snowboarding in Whistler. As the first (and only?) graphic novel (comic) about snowboarding in existence, this book deserves a lot of credit for bringing snowboarding to a new medium. 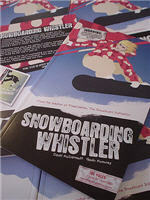 The book is published by Freestylemax.com - the same company who created the Freestylemax snowboarding doll. Anyone who's spent a season in Whistler will recognise the familiar scenery as well as many aspects of the Whistler seasonaire lifestyle: getting pissed off with your house mates, playing practical jokes on your house mates, love triangles, lack of female action, weekends in Vancouver city etc... as well as the joys of shredding backcountry powder, hitting the park and enjoying the Whistler nightlife. The story is very Aussie-centric - which is no great surprise (nor a bad thing) seeing it was written by Australians, for Australians and is about Australians. My one criticism would be that the characters are largely of the stereotyped 'skier-hating-snowboarder-dude' type, and the number of times they are heard to say "this might sound gay, but..." is a little tedious. However, there is some good humour in there too, with several laugh-out-loud moments. It will appeal most to Australians, but is also recommended reading for anyone looking to head out to Whistler, as advice and tips are woven into the storyline, for example how to wax a snowboard and various trick sequences. Overall, Snowboarding Whistler is an interesting and original way of documenting the Whistler winter season experience and certainly worth a read if you're planning on doing it yourself, or have already experienced it.